Nearly two decades after she lost her second child to a rare genetic disease, a woman is helping others affected. Sarah Moore's first daughter Harriet died of mitochondrial disease in 1996 aged 18-months-old, then in 2002, four-year-old Kimberley also died. Mrs Moore, from Bath, is planning a skydive to raise money for The Lily Foundation charity which is dedicated to fighting the incurable disease. Mitochondrial disease eventually leads to organ failure. She said: "If I think I can help other people now then that will help". Symptoms of the disease, which vary, include loss of muscle coordination, seizures, vision loss, hearing loss and organ failure. Mrs Moore said: "You always look back. You have the milestones. "They say lightning doesn't strike twice, but believe you me it does." She said the support of "strong family" and "amazing friends" and her young son kept her going. 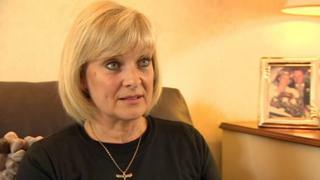 When her daughters died, Mrs Moore said there was "nothing known about mitochondria at the time". She added: "To find out there is this foundation now and they are doing this research and helping parents is just amazing, so I want to help them. "Obviously so much more research is needed and a lot of money is needed for that research. So if jumping out of a plane will do it, I want to go for it."